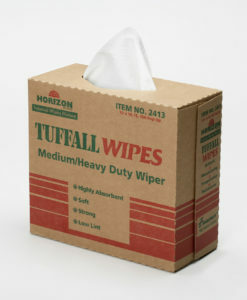 Horizon’s Multi-Purpose Tuffall Wipes are the most popular general purpose wiper used today. They are double re-creped wipers with a soft outer layer and an absorbent inner layer. The Tuffall Wipes are highly absorbent and strong, yet are soft and contain low lint. Count on these Tuffall Wipes to be the perfect solution for janitorial, manufacturing, transportation and maintenance cleaning needs.